Not only are they making their dream of extended and long term travel a reality. they are doing it despite having kids, despite not being rich and despite all their obstacles and challenges. Type of travel: Road Trip In a Veggie powered truck and slow travel. Challenges: Internet connectivity. Balancing work time, education time etc.. Finances: Currently use their savings but their long term plan is to grow their online business. The Dennings are homeless on purpose. 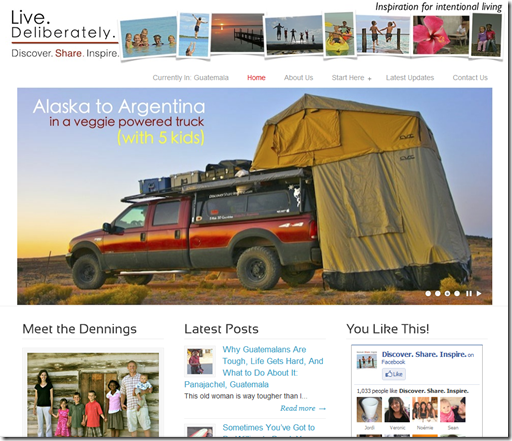 They are living in a veggie powered truck and are travelling from Alaska to Argentina with 5 kids in tow. That’s right, FIVE KIDS, Five. I think you are going to be in total awe with this amazing family and what they have done so far. The Dennings don’t just want to live abroad, they want to explore the world. Since 2007, they have been determined to create a location independent lifestyle so that they can live the way they want to. Who doesn’t right but they have gone to great lengths to make this happen and in a very interesting way i might add. They’ve simplified their lives to the bare essentials. No mortgage, no utilities, nothing except their truck and what they can put in the truck. To fund their lifestyle originally, they were living off of an income but they lost that in 2008. Now they live off of their savings and have all they need to continue to live simply – which they are more than pleased with. However their long term strategy is to grown their online business which is already generating some money. They even have a few products teaching other people how to design their own lifestyle like they have. The Dennings are a special case and it looks like there is no end in site for their adventure. Their latest adventure is taking them across North and South American. They ‘live’ in their truck when they are traveling in between places but whenever they get a chance, they stop and rent a place so they can stay longer. The last time i spoke to them they were renting a house in Panajachel, Guatemala and were there for almost two months. Before that they spent 7 weeks in Bacalar, Mexico. Go read about them at Discover Share Inspire and you’ll never say “i can’t again”. Finances: They started their own a web programming company which the run completely online. The burns family say that they are a pretty average family of four who decided they weren’t happy with their lives in suburban Australia. They were trying to juggle careers, maintain a house, pay the bills, have a social life on the weekends and most importantly, still finding time for to be with their children. They decided they needed to do something different with their lives. They considered a bunch of options including career changes, selling the house and moving from the suburbs to a smaller town and even considered finding work overseas. But none of that seemed like the right answer. in late 2009 the Burns decided to take ACTION and act on a long-term fantasy of long term with their two young children. The Burns didn’t have a huge savings so they opted to use the skills they had which was web programming and set up their own business online. Exactly two year after they decided to take action and pursue their dream of long term travel, they set up a house in Penang Malaysia to use as a base to travel the world from. They aim is to spend 6 months of the year in Malaysia and 6 months of the year travelling. 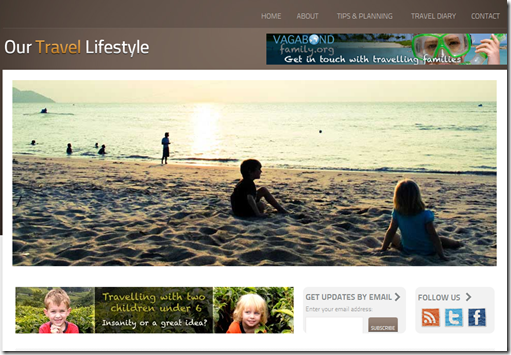 They also have a great site for other travelling families and couples to meet called Vagabond Family. I joined it myself and love connecting and reading about other families. It makes me feel less fringe and more normal. Our next family is a father son team. Talon is a single dad to an amazing 10 year old boy named Tigger. The fact that he is a single dad travelling is simply amazing but what really blew me away was what he told me about his son. You see his son has special needs. I’ll tell you more about something amazing that happened in a bit. Let me first tell you how their journey began. Everyone has their reasons for wanting to travel or live abroad and their story is a great one. In May 2011, after years of working in intensive care, trauma, and with the dying, Talon left his traditional work life to embark on a round-the-world trip. Now you would think that they at least had a ton of money in the bank right? NO!!! Talon and Tigger began their journey with $900 in the bank. Talon has been very creative in how he manages to support he and his son from doing medical transcription and writing to photography. He even became a scuba instructor while in Honduras which has helped them bring in some descent money. Talon says their expenses usually average about $1,000 USD a month and says he could even cut it down further if he wanted but doesn’t because they really enjoy eating out. His son Tigger has done so well that he is now off all his meds. Talon attributes the marked improvement in his sons anxiety and sensory issues to the amount of time he spends with his son and “world schooling”. 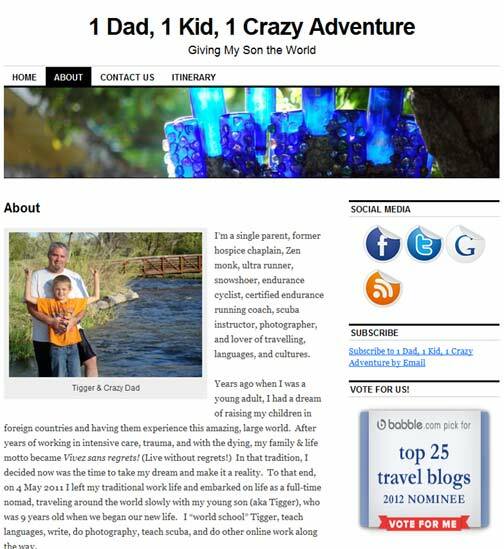 His sons progression has reaffirmed and eliminated all the doubts he used to have and he is now 100 percent positive that his decision to live abroad, travel and home-school his son was the best decision he could have made for his 2 man family. Type of travel: Expats living in one place. Finances: Dad works remotely as a web designer. Mom teaches English. Created a product online, teach and run a web based business. Our fourth story is another family and rather than living nomadically and constantly travelling, they chose to stay in one place, China. Their story is similar to the Burns in terms of why they chose to live abroad. Basically they were a family that was tired of waiting for the right time to travel, the right time to experience things, enough money to do it all, and tired of waiting for the pieces to fall together so they took action to make it happen. 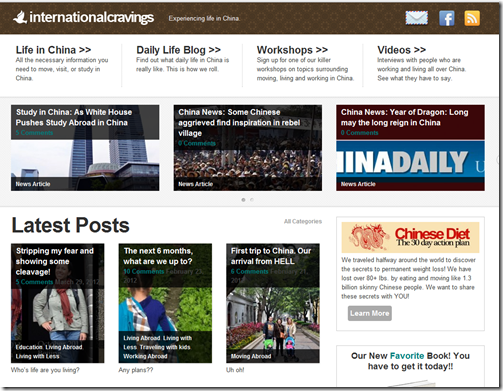 In Feb. 2011 they moved their family of four to Guangzhou China. With two small children (1 & 3 at the time) there were many things that they were unsure of but they knew one thing for sure and that was that they wanted to go on adventures with their children and experience the world as a family. They have made some amazing friends and have had some unforgettable experiences together. Mom says that the ability to give her her older child the opportunity to learn Mandarin and experience a culture at such a young age has been both fun and exciting. Now both of their children speak Mandarin and their almost 5 year old is fluent. Mom told me a funny story; Their 2 yr old son has learned potty training “split pant” style and she just thinks it’s hilarious watching him flip back and forth. Challenges: Had over 18,000 us dollars in consumer debt that they paid off. Finance: Sold his crap on eBay and got out of debt. Now makes a living online and can literally work anywhere he wants to when he wants to. Adam Baker from Man vs. Debt is probably the most famous modern day family i know who decided to leave it behind for a few years to travel. 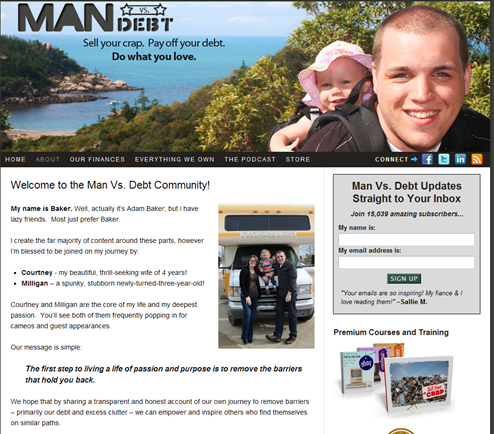 If you haven’t heard of Man vs. Debt than let me fill you in. In 2008 after the birth of their daughter, Adam Baker and his wife Courtenay spent a year selling all their crap and paid off over 18,000 dollars in consumer debt. Then In June 2009, they left for what was to be a year in Australia, but quickly turned into more mobile travels through Australia, New Zealand, Thailand, and finally back to Indiana. Now Adam and his wife are running several business online, have several products that help other people do the same thing they did and he’s not done yet. That’s it for now. Stay tuned as i add to this growing list of amazing and inspirational families and couples who left it all behind to travel or live abroad. So…. do you WISH or do you WANT to lead a location independent lifestyle? Are you willing to TAKE ACTION and are you DETERMINED to follow through? The next time you say I wish I could travel but can’t, I can’t, I hope you think of these five families who despite having kids, despite having debt, despite not being rich or whatever reason you keep telling you that you CAN’T, they did it. Because they did they took action and had determination. Part of an ongoing series showcasing and featuring families and couples who are travelling full time or for extended periods of time. Some travel just for a year while others have been travelling for more than 5. These are not lottery winners or rich people. They are just ordinary people like you and me who made travel their goal and decided to work at that goal to make it happen. I hope it inspires you to do the same no matter what your goals are.